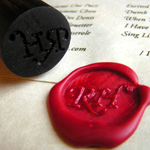 I love the elegant look of wax seals, but it’s sometimes difficult (or expensive) to find the perfect design. The RageHaus blog has a great tutorial on making a custom seal using a wooden dowel. The pattern is incised with a wood-burning tool, so unless you have a very steady hand you might not be able to get the same kind of fiddly little detail that you would with a cast metal stamp. If you don’t have a wood-burning tool, I expect that it might also be possible to carve the design with an X-Acto knife or a small Dremel tool. The technique should be fine for things like monogram initials in the font of your choice or patterns with a fairly simple outline (say, bats rather than intricate spiderwebs). Making your own is certainly cheaper than having a custom stamp designed for you, and the dowel should hold up much longer than stamps made of linoleum or other soft materials. The DIY method gives you great flexibility in matching a seal to its intended purpose: The invitations for each party you throw could have different themed seals, and RPG props, Halloween decorations, or special documents could all benefit from a seal with an appropriate design.